One of my freelance gigs involves writing about wineries in Napa and Sonoma for a travel destination website with a healthy 60,000 unique hits per month. For that reason I've spent time on many winery websites, and I've developed a fondness for wineries that offer free recipes from their own kitchens. 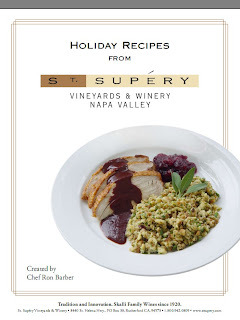 From time to time I've run winery recipes in The Culinary Gadabout, but today I've got something that steps it up a bit: a very nicely done downloadable collection of Holiday Recipes from Ron Barber, Chef at St. Supéry Winery in the Napa town of Rutherford. The recipes, which serve 10-12, include Brined & Roasted Turkey with Cabernet Sauvignon & Herb Gravy; Classic Cornbread Stuffing; Old Fashioned Glazed Sweet Potatoes; and Pumpkin Pie. If that sounds a bit too Thanksgiving-ish for you, download it and put it aside until next November. And then download St. Supéry's other collection, "Recipes from Napa Valley." It's got some yummy temptations that would be great not just during the Holidays but any time this winter—I'm dying to try Lamb Loin with Fennel, Tomato and Olive Ragout. And doesn't Pan Roasted Breast of Chicken with Sauteed Granny Smith Apples & Toasted Walnuts sound dee-vine? You are so welcome! HH to you, too.